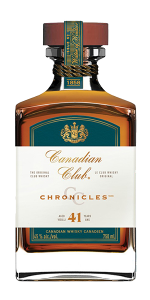 This 41-year-old Canadian whisky is the successor to 2017’s Canadian Club 40, and is the second of a series that will include future 42, 43, 44, and 45-year-old annual releases. The whisky was distilled at the Hiram Walker Distillery in Windsor, Ontario in August and September of 1977, and is the same distillate as the 40-year-old. However, there have been subtle touches of aged Cognac, Rye, and Sherry from within the Beam Suntory family added to this edition.